Ever since the news of Sven-Goran Eriksson's sacking was leaked back in April, Manchester City fans have been in limbo. However, just two days after the Swede's departure was made official, already it appears they are looking forward to a bright new dawn under Mark Hughes. But how is it that a man who is a legend down the road at United suddenly holds the hopes and fears of rivals City in his hands? Speak to those who know him best, and barely a critical word is uttered among them. It is his tactical nous, his motivational skills, his ambition - and the support of a fantastic backroom staff - which help mark him out as one of the brightest men in management, they say. Here, BBC Sport takes a look at just what City fans can expect from the new man in charge at Eastlands. Despite being regarded with such reverence as a player, Hughes was not identified as a future manager by many of his peers. Born in Wrexham, Wales on 1 November 1963, he played in his first professional match - at Man Utd - at the age of 17, going on to make nearly 800 club appearances, scoring 221 goals. He graced seven different clubs in English, Spanish and German leagues, and the international stage with Wales, scoring 16 goals in 72 outings for his country. Yet the unassuming Welsh lad from the small town of Ruabon, was never one to boast of his achievements, nor shout about his ambitions after his playing days were done. "Mark was very quiet," Dean Saunders, his Wales team-mate for over a decade, told BBC Sport. "He was a great, obviously, very determined and a real team player. "But you wouldn't necessarily have picked him out as management material in the dressing room." Hughes's Wales captain, Barry Horne, adds: "Mark was well liked but he was very much his own man. "He wouldn't be shy in telling someone if he thought they weren't pulling their weight maybe, but he was never one to shout his mouth off. It wasn't his style." However, another Wales team-mate, Neville Southall, admits a keener eye could see a "real thinker, a scholar of football" beneath Hughes's reserved exterior. "Everything he did screamed 'winner'," the former keeper told BBC Sport. "All right, he was quiet, but he didn't need to shout and scream. He always had a quiet authority. "He would walk into a dressing room and, without saying a word, he commanded respect. It was always clear he could remain in football beyond his playing days, it was just a case of whether or not he wanted to." That opportunity to step into management came along sooner rather than later for Hughes when he became caretaker manager of Wales soon after Bobby Gould's resignation in 1999. Suddenly, Wales's 'quiet man' was entrusted to lead a group players many of whom he had played alongside for years. Not that it caused a problem, says Southall, who was named temporary assistant alongside Hughes: "For any other man it might have been a problem, but from day one Mark was the gaffer. "The players immediately knuckled down and went about listening and learning under him. That's the respect he commanded. Some take to management like a duck to water - and Mark certainly did that." One of those players who witnessed Hughes's smooth transition from player to manager, was John Hartson - a striker who would go on to prove pivotal to Hughes's Wales. "I played a few games under him but as soon as he was the gaffer, that was it," he told BBC Sport. "I mean, for a start, it was Mark Hughes, a living legend. "But more than that, from the start it was clear he had so much knowledge, so much experience, so much to offer. You looked around the changing room and you knew, we all knew, this was the man who could turn us around." And turn them around he did. As Horne explains,” to be honest, Mark took on a Wales team that could barely get much worse," but, still, Hughes surprised many in just how big an impact he had. In their attempt to qualify for Euro 2004, Wales came agonisingly close, beating Italy in their qualification group and only losing out in a two-legged play-off to a Russian side led by the hugely-experienced Guus Hiddink. "The impact he had for Wales was vast," says Horne. "He organised the players, got them playing and playing in a system - 4-5-1 - that was quite innovative at the time. "He came so, so close to getting them into a major championships for the first time in their history ever." As Southall adds: "He would have gone on and done it at the 2006 World Cup, I'm sure, but the Football Association of Wales couldn't match his ambition." Hughes was fast becoming one of the brightest up-and-coming managers in the game and when Blackburn came calling, the Welshman took the step into club management. In his four years in charge, he established Rovers as top-half regulars in the top flight, challenging for European football, and taking the club to three semi-finals. A relatively short career so far, maybe, but one that already had him reputedly being fought over between the Premier League's top clubs before Manchester City got their man. So what is it that sets Hughes apart? "Mark is an extremely bright football man and, having played across Europe and the world, he knows tactics, formations, how to form a team as well as how to break down opposition sides, inside out." That is the conclusion of Hughes's biographer David Meek, a rare confidante of Hughes during and beyond his playing days. "On top of the that, Mark is a 'modern manager' in that his eyes are open to the advantages of technology and the value of nutrition and healthcare for modern players," he adds, an argument backed up by those who played under and worked alongside him. "He puts his point across to perfection," says Hartson. "He knows what he wants on the training ground, he ensures that the players know their roles exactly and he provides all the information on the opposition that we need. "Come matchday, nothing is left to chance and there are no excuses. Preparation for matches does not come more thorough." Southall adds: "He has his lieutenants on the training pitch in Mark Bowen, Eddie Niedzwiecki, Kevin Hitchcock and so on, and it means he can step back, watch everything and everyone and take it all in. "He's a chess player, if you like, very astute and thinking about things two or three moves ahead." And what about those who criticised him and Blackburn for their supposed over-aggression in matches? "What Mark has done with Blackburn, just as he did with Wales, is do what he had to do, with the players he had, to make them successful," says Southall. "At his next club - City - he will do what is needed and what is right for those players." Match of the Day pundit and Hughes's former team-mate at Chelsea Gavin Peacock adds: "It is not that his sides go out in an attempt to 'stamp their authority' as such, it's that you have to earn the right to play football. "And, let me tell you, contrary to belief, Blackburn can - and do - play their stuff. His teams mirror him in a way - yes they are aggressive, he was aggressive as a player too, but boy can they play." "It's no good having all the tactical nous in the world, if you can't implement it with the players, and that's one of the things that sets him apart," says Saunders. And it is the way Hughes gets his players playing for him that appears to earn him the most plaudits. "Mark is and always will be, I think, a quiet man and manager. But he is such a good communicator," says Hartson. "You don't need to rant and rave to get your instructions across, and Mark is a case in point. "I know I - and all my team-mates with Wales - would run through brick walls for him. When we were playing 4-5-1, Gary Speed - a legendary midfielder - was playing left-back. That tells you all you need to know. "The fact is that players go the extra yard for Hughes. Look at the way Arsenal players roar around the pitch under Arsene Wenger, and the way United players do under Sir Alex Ferguson - it's exactly the same with Mark." Horne says: "He has the midas touch of getting the best out of players," and, as Peacock adds: "Blackburn, from front to back, are testament to Hughes's talents as a motivator." It is not a lone effort from Hughes, though, and he will take with him to City his backroom staff of Bowen, Niedzwiecki and Hitchcock. It is this team, says Hartson, that is "absolutely crucial" to Hughes's success. "They put so much work in, organisation, hours looking at videos, preparing notes about the opposition and ensuring every players knows their job and the strengths and weaknesses of their opposition number," says the former striker. "No stone is left unturned by these guys and they complement Mark perfectly." Southall adds: "Mark isn't stupid. One man can't do it on his own these days - Man Utd, Arsenal, all the top teams, have a top coaching set-up and they don't come much better than Mark's." It is a coaching team that has been together from very early on in Hughes's career and, says Horne, "that is not something you stumble upon. "Mark will be the first to say his backroom staff deserve all the credit in the world." All of this has helped ensure that Hughes is in the rare old position of being able to match his success as a player in the management world - and it is his ambition to do just that that has led to him cutting ties with Blackburn, say those who know him well. "Mark is fiercely ambitious," says Horne. "He goes about his business in very much a quiet manner but, just as he did as a player, he wants to be the best." Will the likes of Santa Cruz follow Hughes to the Eastlands Stadium? And that, say Saunders and Southall, means Blackburn are unable to compete with Manchester City's stature and spending power. "I love Blackburn as a club, but Manchester City are a bigger club than them, there is no point arguing about that," says Saunders. "They have the bigger fan-base, more finances, and it is a step up for Mark - and this time was always going to come, just as it did with Wales, when Mark wants to improve, to take on the bigger challenge, and to be at a club that can match where he wants to go." And, says Southall: "The fact is, at Blackburn, he was trying to put together a jigsaw whilst constantly balancing the books. Considering that, it's remarkable he's done as well as he has. "But Blackburn can't go out and pay the likes of Ronaldinho £200,000 a week like City reportedly can and, backed in the transfer market to that extent, Mark can finally start to mould a team in his perfect image. In an image that can truly challenge at the top." So while Hughes had to content himself with bringing in players on the cheap and turning them into Premier League stars at Blackburn, at City he will have the power to bring in tried, tested and proven talent. The purchases of Roque Santa Cruz (£3.8m), Christopher Samba (free) and Morten Gamst Pederson (£1.5m) highlight Hughes's eye for talent on a strict budget. But will he be able to prove as successful with the backing of a multi-billionaire such as City chairman Thaksin Shinawatra? "It's the one thing he hasn't had the chance to prove he can do," says Peacock. 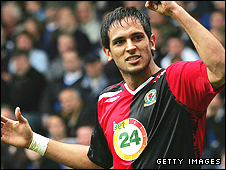 "But look at the quality he brought in at Blackburn; he has an eye for quality." "Mark knows football and he knows players," says Southall. "And, regardless of the fee, he can spot players and things in players that he wants in his team. "And, lest we forget, whilst he has had to work on a budget at Rovers, his playing days were all spent at clubs where bringing in big-money signings were the norm. It won't faze him at all." That is, unless, as Sven-Goran Eriksson arguably found out to his cost, he is not allowed to do things 'his way'. "The fact is that Blackburn are a quality club, run by quality people, who are very stable and real football men," says Saunders. "Mark might, and I hope he doesn't, finds he misses that at City." "What Mark has to hope - and will have had assurances on I'm sure - is that this isn't a plaything for Mr Shinawatra," says Southall. "He's not a football man, and it's not good if he messes about with all this money for six months and then gets bored. "But I'm sure Mark approached the meetings with City in the frame of mind of 'this is me and my way, if you like it, fine, if not, goodbye'." So can City fans look forward to Hughes managing the club as he sees fit? "Mark has been as successful as he has because he's been allowed to get on with things," says Hartson. "Everybody, including Mr Shinawatra, will know that and I don't think he has anything to worry about." Meek adds: "Mark may be quiet, but he is absolutely no pushover. He will stand up for what he believes, he will back his staff, players - and principles - to the hilt, and given time he will do whatever is necessary to make City a success. That's the kind of man he is." 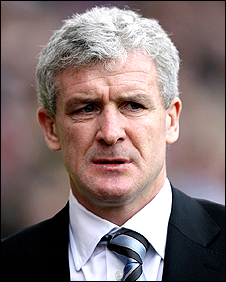 So, just how far can, and will, Mark Hughes go? City may only be his third club but, as man of the moment, it would appear he has the footballing world at his feet and the finances and fanbase from which to continue his assault on the biggest and best of world football. "City have got themselves an almighty coup," says Hartson. "Mark, to my mind, is third only to Sir Alex Ferguson and Arsene Wenger in the Premier League manager ranks already, and he will only get better and better," says Southall. "Simply, out of anyone in the world, he is the man I would have wanted at Chelsea," says Peacock. "He is a rare thing these days - a vastly talented, focused British manager, who has the been given the chance to prove he belongs at the top of world football. And prove it he will." And while many believe that City's fierce rivals United may cast alluring gazes at Hughes in the future, for now it appears they have a man in charge who can finally bring them the success for which they have craved for so long. "He may need time, and a bit of luck, but Mark is on the path to become one the truly great managers of his generation," says Horne. 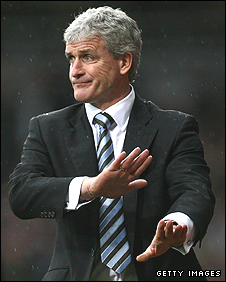 Shinawatra, the man who sacked Eriksson, will be desperately hoping Hughes does just that.